This entry was posted on April 11, 2019, 11:00 AM and is filed under Ambulance photos, Fire Department History, Historic fire apparatus. You can follow any responses to this entry through RSS 2.0. You can leave a response, or trackback from your own site. 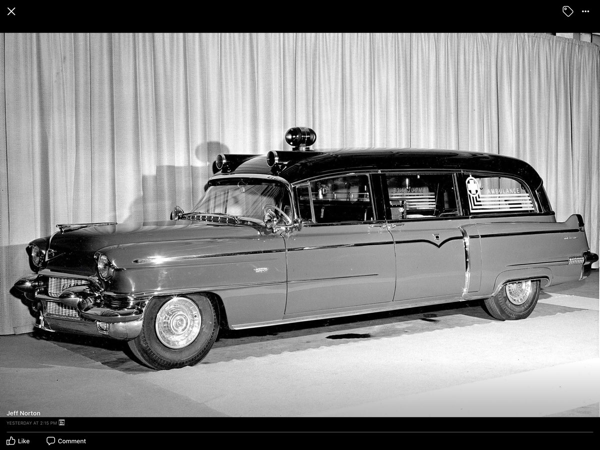 Those 1956 Cadillacs were the first CFD ambulances that I remember seeing as a kid. The first one I remember was Ambulance 3 when they were on Fullerton east of Central Park at Engine 114’s old house. I also remember one as Ambulance 7 at Engine 108’s quarters at 4935 N Lipps as well as Ambulance 13, 6, 20, 15, and 11. Some of them were still running well into the 1960s. I remember seeing Ambulance 15 running with one around 1964/65. I just found out that it probably won’t work that way as there are multiple people of the same name. Danny please write me off this site to my Email (nevid@seznam.cz). Thanks again! Danny thanks a lot, how can I get into the group, looks like it’s not public. I couldn’t even find it through Facebook itself, had to google it, but still can’t see the content. Danny what’s the exact name of the group please?